James McNeill Whistler painter, printmaker and etcher was born in Massachusetts, USA. He attended West Point Military Academy as his father wanted him to enter into military service. Whistler started etching there but he left in 1854, continuing to etch whilst a cartographer (map maker) He moved to Paris in 1855 where he studied art at first under Gleyre. He arrived in London 1858 where he completed the ‘Twelve Etchings from Nature’ set (the French Set) living initially with F.S.Haden, a surgeon by trade, whose daughter he later married. The collaboration between Whistler and his father-in-law during this period helped them both to develop their etching styles. Haden also became famous as an etcher. 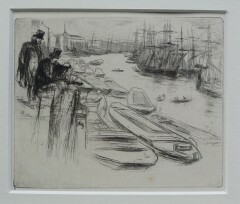 It was in 1859 that Whistler began his next series on the ‘Thames’ consisting of sixteen etched view of the Thames Docklands and published in 1869. He is best known for his view of Venice, his ‘Venetian’ set was published in 1880 by the Fine Art Society. 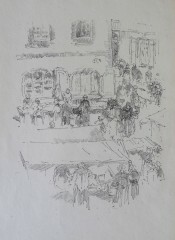 A second set was published by Dowdeswell in 1886 titled ‘A Set of Twenty-Six Etchings by James A McNeil Whistler’. 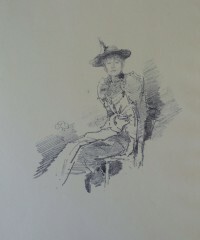 Apart from his Venetian etchings, the plates which Whistler executed as a result of a trip to Amsterdam are much rarer. 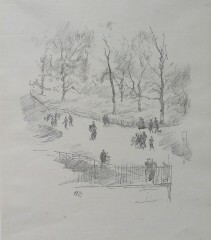 Impressions of his earlier etchings i.e French and Thames are often found with their margins but unsigned. His later etchings-the Venetian and Amsterdam prints are often found trimmed to the plate mark and signed with the butterfly monogram on a tab below. 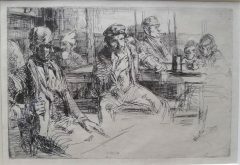 Whistler was introduced to lithography by T.R.Way in 1878, but he preferred etching, most of his lithographs are figure studies, some of which were published as auto-lithographs in ‘The Studio’ magazine in the 1890’s. 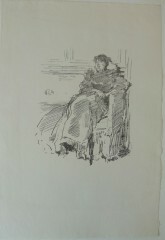 We have recently purchased a small collection of lithographs by Whistler from a corporate collection, most of these originated from his sister –in –law’s estate, Miss Rosalind Birnie Philip. 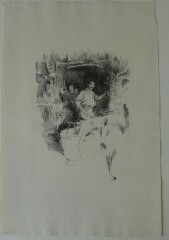 His lithographs, with the exception of the published editions, are quite rare. Levy, states that the lithographs were not at that time considered as an art form and were generally unpopular with the public. Lithography had been used as a form of reproduction since the 1830’s when the only way a printer could reproduce an image was to either use lithography, wood engravings & wood cuts. Photographic illustration began to emerge in the 1880’s. Therefore, the use of lithography, although taken on board with the early printmakers in the early 19th century, was scorned by the general public. 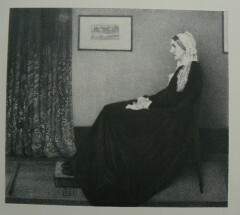 Whistler was encouraged by Thomas Way to take up lithography. Levy states that Whistler would make a stone and maybe only take a few impressions from it, making more impressions when the demand was there. He never made more than 100 impressions from the one stone. After Way did the first catalogue of his graphic work, 130 works were listed, although Whistler had made 160 prints. A few months after the catalogue was published, Whistler broke off his friendship with Way and retrieved all of his stones from Way’s keeping. 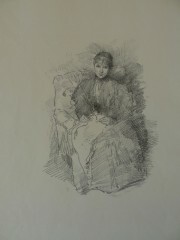 ‘The Lithographs of James McNeill Whistler. 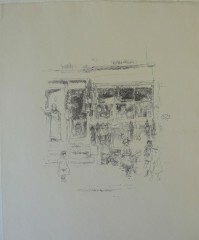 A catalogue Raisonne’ by Spink, Stratis & Tedeschi is an invaluable book in regard to Whistler lithographs. They state that when Whistler died, part of his estate included 103 original stones and 18 transfer drawings was left to Rosalind Birnie Philip. As his executrix , she commissioned Frederick Goulding’s firm to print posthumous editions. Fifty-five posthumous editioned subjects were exhibited at Robert Dunthorne’s Gallery in 1904. Goulding in fact pulled from ninty-four stones and transferred and printed ten previously untransfered lithographic drawings. Posthumous stamps were made for these plates, but not all of the impressions were stamped with her mark. Therefore the watermark on the paper helps to date the impression.Unlike etching plates which can be kept for some time and refaced, lithographic stones are hard to maintain. Many were erased after the Goulding edition.